Alford Craft Market - promoting Lincolnshire crafts via our events, shop and craft classes. We are a not for profit organisation founded in 1974. Our main events are held on the May and August Bank Holidays in the grounds of Alford Manor House, West Street, Alford, where we have a wide variety of quality Lincolnshire crafts for sale, free live music, entertainment and craft demonstrations, and entrance is on a 'Give what you can afford' basis. We also hold Easter and Christmas Markets and Tuesday Markets during the Summer in the Corn Exchange . In April 2015 we opened our Alford Craft Market Shop selling a large selection of our craftsmen and women's work at 1 West Street, Alford LN13 9DG. Open 5 days a week 10 - 4pm Closed Thursdays and Sundays. 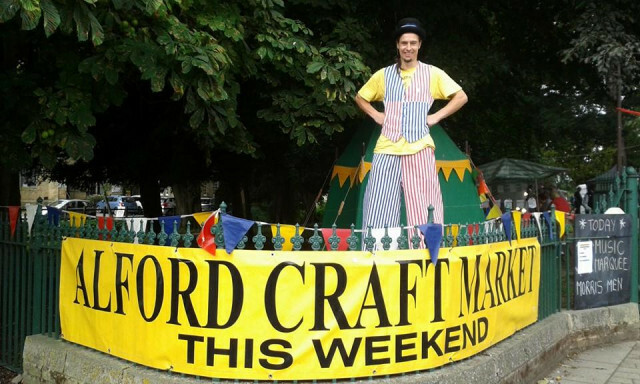 To the rear of the shop we have the Alford Craft Market Centre offering a wide variety of arts and craft classes including felting, applique, knitting, sewing, crochet, pottery, glass fusing, lampwork, mosaics and ceramic painting. 1 West Street, Alford, Lincs., LN13 9DG.